If you are running a business, you want to make sure that everything goes to plan. Unnecessary accidents, product defects and failures just simply do not fit in the budget. Sometimes businesses do not anticipate problems happening. If a machine breaks down, the question pops up about who will fix that machine. Sometimes using outside resources to fix one of your machines is costly. If you could find a better way, wouldn’t you try that? CMMS software is a major solution. CMMS is short for computerized maintenance management software. The goal of CMMS is to make it simpler and easier for businesses to implement what is known as Total Productive Maintenance, or TPM. Total Productive Maintenance is a principle that was founded by an organization called the Japan Institute of Plant Maintenance, which formed in 1961. Total Productive Maintenance shifts the focus of business leaders toward preventative maintenance. The idea views maintenance as a vital part of the work flow and one in which a healthy amount of attention can work wonders for the business. The concept of TPM as a whole aims to put people who are most familiar with the machines they work with in charge of the maintenance of the machine. CMMS software aims to bring the general goals of TPM more easily into the hands of businesses. Instead of being just a simple set of rules and a spreadsheet, FaciliWorks CMMS makes TPM something people can see and track on their computers, tablets and smartphones. What this means is that a TPM plan not only assists your business in being the most productive, it also makes sure your business is safe and secure on the ground level for staff. FaciliWorks CMMS further makes it easy to keep track of these three goals by providing software that is designed specifically for any size business. If you are a business owner concerned about the well-being of your staff, the upkeep of your machines and the potential of profit, you can not risk the absence of a CMMS software to help keep track of TPM. 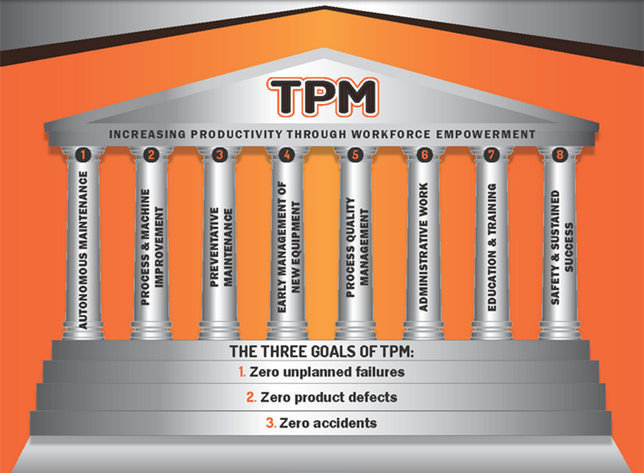 CMMS software helps keeps track of what is known as the eight pillars of TPM. One of the eight pillars of TPM is autonomous maintenance, which means operators are in charge of monitoring their own machines and work spaces. CMMS software can help in keeping every employee on task and organized. When used as recommended, a scheduled maintenance task will never be missed if FaciliWorks CMMS software is used. Your CMMS will help make sure that a skilled technician who is familiar with the machine is the person performing the maintenance. CMMS software helps in another pillar too: preventative maintenance. CMMS makes sure that each machine is worked on often enough to catch and fix any problems that may come up before the equipment fails. Whether being used in a single facility or across many facilities, FaciliWorks CMMS can show drastic improvements to your profit and safety. CMMS can help keep you and your business from experiencing failures, accidents or defects that would set you back. If you want to continue operations going smoothly, FaciliWorks CMMS software is an absolute must.